Bicyclist opinion, highway project prioritization meeting = round peg, square hole? Sorry, folks – this is going to be kind of a longish and dullish post without pretty scenery pictures. Your eyes may glaze over. But I have some thoughts I need to process after attending a Nebraska Department of Roads project prioritization meeting in Gering yesterday. I didn’t really know what to expect, didn’t know whether it would be worth my time to attend (two hours on a weekday morning! ), since this was billed as the second round of a project prioritization process. Would my views as a bicyclist fit in? Roads need shoulders. Nice, wide, smooth ones. Shoulders should be maintained with the same level of care as the main traveled surface. A disjunct surface between the lane and the shoulder is bad. Surface cracks are bad – deep, spoke-breaking perpendicular ones, and also the deep, wheel-trapping parallel ones. We would much rather ride on the shoulder than in the traffic lane, but very few road shoulders exist or are in good enough shape to ride. I felt like I was trying to fit a round peg of an opinion into a square hole of a question. The point of the meeting was to make comments on a list of 12 NDOR West Region Candidate Projects. For the the full NDOR West Region Candidate Project List, click here. “Good Life. Great Journey.” Heck, yeah, man! That’s what it’s all about! But then, the metrics set in. We have these 12 potential projects, see? And we have limited funding. So we have to use engineering performance, economic performance, and stakeholder input to set priorities. Engineering performance means things like safety, traffic volume, congestion, time savings, cost. Stakeholder input means, well . . . for a two-hour meeting on a weekday morning, from what I observed, it means primarily the opinions of: 1. people who are paid to be there as part of their jobs, 2. people who are retired and have the time to dedicate to promoting their interests. In the half of the room in which I sat, the most vocal and numerous participants seemed to be those representing the Heartland Expressway Association (made up of business and local government interests) and some folks from Chadron who are riled about an idea to install a roundabout or any possibility of a Chadron bypass. More trucks. Move more vehicles faster. Take pressure off I-25. Nationally-important travel corridor. People and goods hurrying through. Jobs are important. The economy is important. Without cash in hand, it’s real hard to make the Good Life happen. And when I’m heading somewhere in my car on a timeline – the Denver airport, for example – I’m perfectly happy to speed along at 70 miles per hour. Time and money are easily measurable. I get that. I’ve worked in both the “hard sciences” and the “soft social sciences.” Quantitative data is more satisfyingly . . . quantitative . . . than qualitative data. But the “time and money” equation leaves something out: quality of life. The qualitative stuff that’s hard to measure. A part of that “stakeholder input” that the NDOR, to their credit, is trying to capture. Is a fast, efficient journey “great”? Or does a great journey meander and discover? It depends on who’s speaking. When it came time for the breakout session to discuss the 12 project options, I wanted to bolt. I didn’t really have a good picture of all the possible projects on the prioritization list. (What the heck is a “viaduct” anyway? Apparently there are some in Melbeta, Minatare, Lewellen, and Bayard that need fixing.) But I stayed anyway, and put in my two cents’ worth. We breakout session participants were each given three dots to place next to project options we wanted to discuss. I put dots on just two projects, roads I had cycled on before: US 26 east of Minatare, and US 26 west of Morrill. My comments were basically: 1. 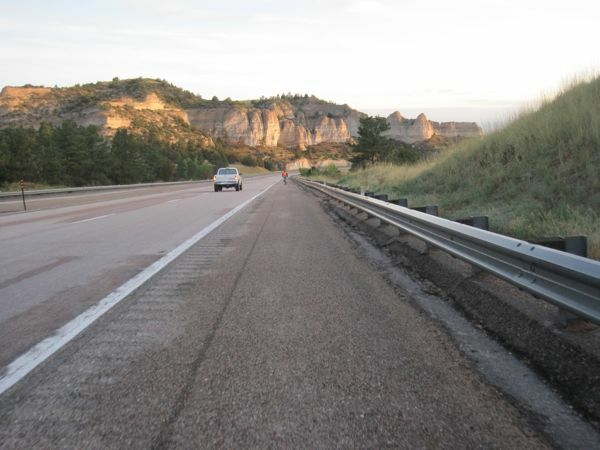 I’ve seen a significant amount of bicycle traffic on Highway 26 between Torrington and Scottsbluff – both leisure riders and commuters. 2. Having worked in the tourism industry, I know a lot of tourists journey on Highway 26 along the Oregon Trail. Oh yeah, and 3. With the Scottsbluff airport suffering of late, Highway 71 south of Kimball has become more important as a back route to the Denver airport. I felt like my bicycle comments were a microdroplet in the bucket. When I approached one of the NDOR presenters afterwards to pass along some written comments from a fellow Western Nebraska Bicycling Club member who could not attend and I began to talk about the importance of good road shoulders for bicyclists, I saw the person’s eyes glaze over (whether from fatigue at the end of a long series of listening sessions across the state, or lack of interest in the concerns of bicyclists, I know not). Come to think of it, the illustration on the NDOR Super 2 highway fact sheet doesn’t show any bicycles, either. Or shoulders, for that matter. I get the sense the Super 2 highway may be a preferred option because it’s cheaper. My question is, how well will the “variable” shoulders of a Super 2 highway accommodate bicycles? I plan to send a link to this blog post to Ms. Kugler, as well as to Nebraska Senator John Stinner (who was present at the meeting) and to U.S. Senator Deb Fischer (who had a representative present at the meeting). If you have something to say about anything I’ve described or linked to, I’d encourage you to send your comments along as well. The deadline is July 29. In my experience, real change is not effected by complaints or hashtagged comments on social media. It happens through paying attention IRL (in real life), by keeping tabs on news media and community developments and by taking opportunities to provide input and speak with decision makers. The Nebraska Department of Roads (NDOR) has scheduled eight regional meetings to continue discussions on its expanded project prioritization process for capital improvement projects. These capital improvement projects are those projects that most impact our economy and allow us to grow Nebraska. Examples include the addition of new lanes, building new interchanges or viaducts, and improvements to the expressway system or federally designated high priority corridors. The regional meetings are a follow up to those held in January where NDOR staff presented information on expanding the agency’s project prioritization process to better consider economic impacts and include more stakeholder input. At the upcoming regional meetings, NDOR staff will share preliminary results of the project prioritization process and gather feedback through facilitated group discussions. Beatrice July 13, 9-11 AM, Holiday Inn, 4005 N. 6th St.
La Vista July 13, 3-5 PM, Embassy Suites, 12520 Westport Pkwy. Grand Island July 14, 3-5 PM, Bosselman Conf. Ctr, 700 E Stolley Park Rd. North Platte July 15, 9-11 AM, Quality Inn & Suites, 2102 S. Jeffers St.
McCook July 15, 2-4 PM, Community Hospital, 1301 E. H St.
Gering July 19, 9-11 AM, Gering Civic Center, 1050 M St.
Local Wyobraska readers, note that last date! Your voice as a cyclist can make a difference – especially since many of our decision makers are not bicyclists themselves and may not understand a cyclist’s needs. I’ve got two examples from the past couple of years where bicycle-friendly infrastructure design changes were made because I took the time to (respectfully!) provide a bicyclist’s point of view to decision-makers who were willing to listen. When the Scottsbluff downtown revitalization project was in its earlier stages, plans called for bicycle racks to be placed behind businesses, off the alleyways. I objected to this, pointing out that bicycles are small vehicles that are more vulnerable to theft, and that putting bicycle parking in a less-traveled area would increase opportunities for theft. Bicyclists prefer to have their rides parked in a conspicuous location near the front of a business – what I call “rock-star parking” – and, if bike racks were placed in alleys, cyclists might not use them at all and instead continue to park their bikes against trees and sign poles along the well-traveled main street. The first set of sculptural bicycle racks that were installed in mid-2015 (paid for through a fundraising effort from the NEXT Young Professionals group) were placed along the main travel corridor on Broadway. I was told the racks would not have been placed front-and-center like this without my comment. These stylized coffee cups are one of six sculptural bicycle racks in front of businesses in downtown Scottsbluff. I had called you earlier this year to ask about the Highway 71 project in the Wildcat Hills, since I frequently ride my bike through there. I just drove through that area this weekend, and I am sooo pleased to see all that nice, smooth shoulder pavement! I can’t wait to ride over the hills and to the newly-opened cafe/country store on the hilltop in Banner County when the weather is favorable! I have a question still.I saw that the rumble strips have not yet been installed on the highway. Is it yet possible for Nebraska to emulate Wyoming and use a discontinuous rumble strip?When I rode on Wyoming highways this summer, I loved the fact that the rumble strips were often discontinuous, allowing just enough of a regular break such that a bicyclist on the shoulder could merge out into the traffic lane to avoid an obstacle (such as road debris or a broken-down or emergency vehicle parked on the shoulder) without crossing bone-jarring, spoke-loosening rumble strip. There was still plenty of noisemaker to alert drivers to out-of-lane drift. It would just be “RRR….RRR…RRR” instead of “RRRRRRRRR”. Can the Highway 71 rumble strip along the outside shoulder be made discontinuous? Is this something the Department of Roads can do on all highway construction projects? It’s such a small thing, but would make a huge difference to those of us who cycle on the state’s highways. I apologize for talking so long to get back to you. I have been checking with several of our design and safety engineers. As far as I know, Nebraska has always used a continuous rumble strip. However, in light of your concerns for cyclists, our standard plan will be modified to give the option for placing a 10’ gap of no rumble strip cuts between each 60’ of rumble strips. I am not sure what the surrounding states patterns are, but this is an option that should be included in future NDOR highway projects. Often, it seems to take much time and effort to change our rules, so I was delighted to see NDOR will try immediately to improve our facilities for our cyclists. For this project, I have spoken with the contractor installing the rumble strips. We have already placed a mile or more of continuous strips on the south end of the project. They are to return tomorrow and continue installing them. We will meet in the morning and work with them to see if their machine has the capability to do this, as they have never put gaps in Nebraska’s rumble strips. So, I don’t know if we are accommodating all your requests, but we will try on the Wildcat Hills to place gaps and your opinion can change future NDOR projects. And just like that, Nebraska got a little better for bicyclists. The discontinuous rumble strip on Highway 71, from the vantage point of the passenger seat of my car. Bugman and I have already taken advantage of the gaps in the rumble strip three times this year: once to avoid a car on the shoulder, once to bypass a gravel bar on the shoulder, and once to pass another bicycle. A discontinuous rumble strip made it much easier for a bicyclist on the shoulder to swing out into the travel lane to avoid the car on the shoulder up ahead. I can’t say how much I appreciate the Nebraska Department of Roads for enabling their engineers to respond to citizen concerns, and for their engineers for listening and taking action. This is a great example of how government should work. Watch for opportunities to have conversations with local, state and national leaders about bicycling infrastructure. Right now, the Nebraska Department of Roads is looking for input. Make your voice heard!